Credit: NASA/JPL/Space Science Institute. Inset: laboratory arc, courtesy of John Dyer. The traditional geologic toolkit is largely confined to observed events on Earth. Traditional geology has, in fact, excluded the one formative process whose signature can be found everywhere in the solar system and in deep space. Electric discharge offers the most direct and complete explanation of the scarring patterns observed globally on Enceladus. The picture above shows just a portion of a mosaic produced from four high-resolution Cassini images of Saturn’s moon Enceladus, taken on February 16, 2005. The section of the mosaic shown above is dominated by what the Cassini investigators call "a broad belt of complex, interwoven fractures." It did not take long for planetary scientists to identify these extraordinary surface features as “fractures.” What else could they be? The traditional geologic toolkit is largely confined to observed events on Earth. Though Earth offers greater geologic diversity than any other body in the solar system, the limitations of earth-based doctrines quickly become transparent as planetary scientists confront alien landscapes and stark surface features never anticipated by textbook theory. Traditional geology has, in fact, excluded the one formative process whose signature can be found everywhere in the solar system and in deep space. Electric discharge offers the most direct and complete explanation of the scarring patterns observed globally on Enceladus. For years, those who favor the Electric Universe hypothesis have called for systematic comparison of textbook geology and electrical discharge scarring theories. They believe that evidence already in hand is definitive, if we will simply look at pictures objectively. Electric arcs excavate surfaces in ways that cannot be duplicated by any other geologic process. Grooves and trenches left by arcs will typically reveal little or no residual material within the trenches, as if a claw simply descended from above to scoop material away. Arcs can produce entwining rope-like trenches (as in “Lichtenberg figures),” where undulating discharge filaments move across a surface without regard for the effects of prior arcing. The surface gouges and trenches can be produced without the lateral surface movement required by fracturing. A comparison of explanations becomes easy. Does the picture above reveal any lateral displacement (which will show up most obviously where one trench angles across another)? Can observed fracturing in laboratory experiments, or anywhere on earth, produce the entwining braids seen on the surface of Enceladus? As shown by the inset photo of a John Dyer experiment, electric arcs can take precisely the form of these surface patterns. 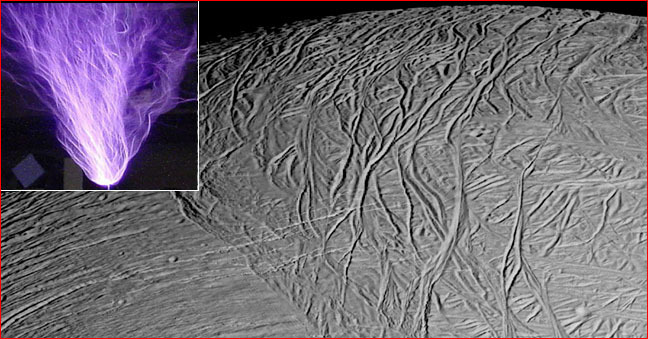 It is only reasonable, therefore, to ask the question: Can the electric arc account for mysterious surface features on Enceladus that have left planetary scientists groping in the dark?